Because we know you love Free Shipping, we have it on over 14,000 different items. In addition, you are also eligible for FREE Shipping when your order is over $49, under 5 lbs and shipped anywhere in the contiguous United States across all items we carry. 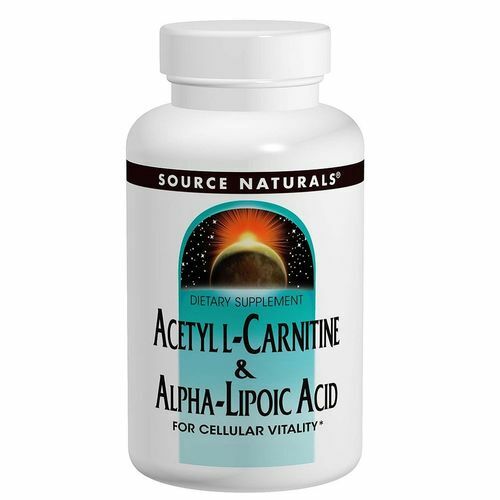 Source Naturals Acetyl L-Carnitine & Alpha-Liopic Acid is made without gluten or other common allergens. Warnings: If you are pregnant, may become pregnant, breastfeeding, have any disorder of blood sugar metabolism (such as diabetes), or suffer from any seizure disorder (such as epilepsy), consult your physician before using this product. Do not use if either tamper-evident seal is broken or missing. Keep out of the reach of children. Notes: Suitable for vegetarians and hypoallergenic: contains no yeast, dairy, egg, gluten, corn, soy or wheat. Contains no sugar, starch, salt, preservatives, or artificial color, flavor or fragrance. Recommended Use: Take 1 tablet, 1 to 4 times daily. While we try ensure that product information is correct, on occasion manufacturers may alter their ingredient lists. Actual product packaging and materials may contain more and/or different information than that which is shown on our Web site. We recommend that you do not solely rely on the information presented on our website and that you always read labels, warnings, and directions before using or consuming a product. For additional information about a product, please contact the manufacturer. Content and information on this site is for reference purposes and is not intended to substitute for advice given by a physician, pharmacist, or other licensed health-care professional. You should not use this information as self-diagnosis or for treating a health problem or disease. Contact your health-care provider immediately if you suspect that you have a medical problem. Information and statements regarding dietary supplements have not been evaluated by eVitamins or the US Food and Drug Administration and are not intended to diagnose, treat, cure, or prevent any disease or health condition. eVitamins assumes no liability for inaccuracies or misstatements about products. eVitamins is a registered trademark of eVitamins, LLC. Statements made about specific vitamins, supplements, procedures or other items sold on or through this website have not been evaluated by eVitamins or by the United States Food and Drug Administration. They are not intended to diagnose, treat, cure or prevent disease. The information provided on this site is for informational purposes only. As always, please consult with a licensed doctor or physician before starting any diet, exercise or supplement program, before taking any vitamin or medication, or if you have or suspect you might have a problem.